Keep all your serving essentials close at hand with this innovative weighted set. There are few things in life more uplifting than preparing and eating a beautiful meal. Worrying about hygiene; however, can be a real downer. Rise up and take charge of your kitchen counter-tops with the Elevate™ Carousel! 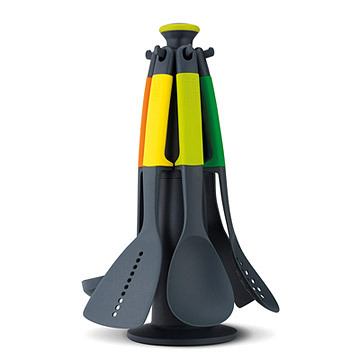 Style meets innovation in this colorful and convenient utensil set. Each spoon, ladle, server and turner has a special weighted handle that's designed to raise not only the head of the utensil off of your work surface but your spirits as well! Especially when you realize there's so much less to clean up! Made in China. Utensils are dishwasher safe. Wipe stand with damp cloth. Heat resistant up to 480 degrees F. Works with non-stick cookware. Handles should not be placed on hot surfaces. Product arrived with a broken tree. I must return it which is a hassle. These may be useful for non-stick pans. However, I don't need as many tools as this has for my non-stick pots, and have found I prefer my stainless for cleanliness and lack of plastic hazards to health. This costs $20 dollars somewhere else. Price is inflated. Ridiculous to charge so much. Sturdy utensil set, with good stiffness during use. Handles are weighted to keep the business end up--nice touch when you lay it down. Great design, my wife loves it. Love the utencils but they fall off the stand with just the slightest touch or nudge. The pegs on the stand that hold the utencils need to be angled further upward. Gravity prevails with the way they are now and you end up with a pile of scattered utencils all over your countertop. I got this for my brother as a christmas gift. He really likes to cook, he loves this set. My daughter has a relatively small workspace near her cooktop. She loves the size and convenience of the carousel because it keeps the utensils handy and it looks nice in the kitchen.